I love all things Chinese, and when its home made I get all excited. Although Chinese food/ buffet is loaded with deep-fried and calories. 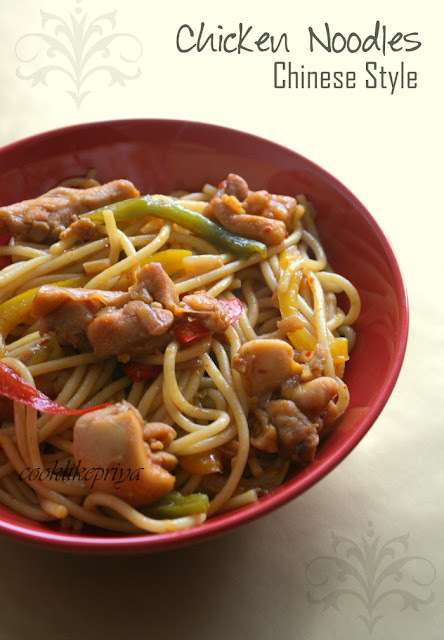 Simple Chinese cooking can be done at home with few ingredients like this Spaghetti noodles which I tried it the Chinese way. There has been a big fude as to who introduced Spaghetti was it the Chinese or the Italians, I am not joking google it to find your own answer. But what ever be it I love Spaghetti and I love Chinese :-) so here is my own twist. 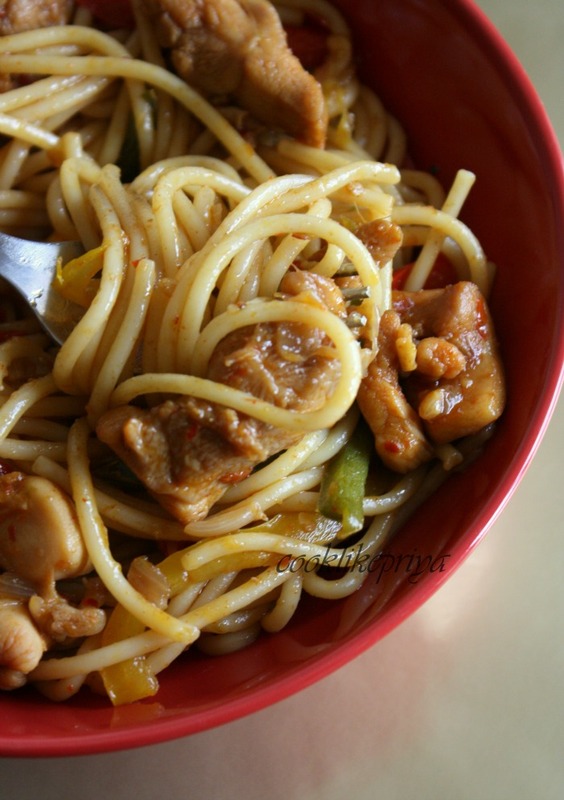 This Spicy Chicken Spaghetti is quite hot with chili sauce and red chili flakes you can alter it according to your spice tolerance. Nevertheless it tastes absolutely yum ! Chop all peppers, onion, tomato, garlic and set aside. Wash the chicken and drain all excess water, marinate with dark soy sauce, chili sauce and salt set aside for 20 mins. In a wok, heat oil add the mince garlic after 3-4 seconds add the onions saute till translucent, add pinch of salt to avoid it from browning. Add the tomato saute well, cover lid and let it cook until mushy. Now add the peppers saute well until cooked, this would take 2 minutes, check for salt and spice, add the red chili flakes. Now add the cooked spaghetti, saute well for 2-3 minutes until all flavors combine. - I used chicken thighs as they tend to be soft and tender, try to get thighs than breast pieces. Chinese style spaghetti?? This is so interesting da.. Looks so delicious and tempting.Love the clicks dear! Feels hungry. Too tempting and nice presentation. 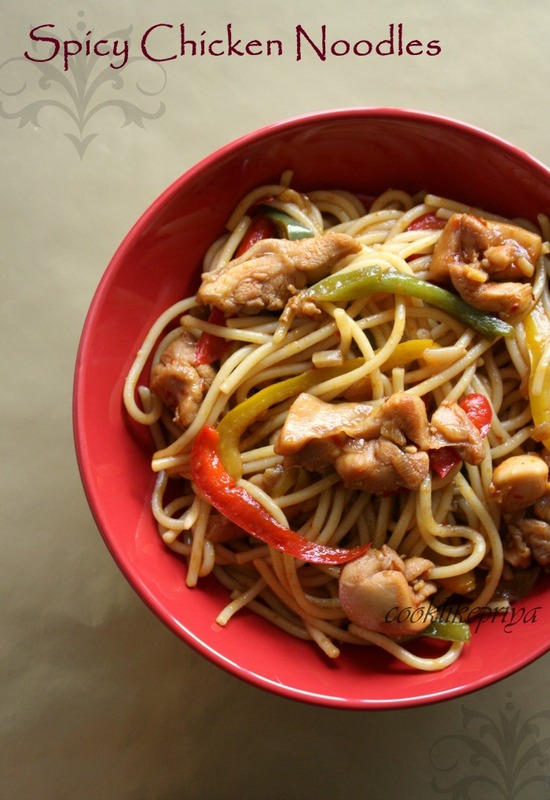 Chicken spaghetti looks delicious........ nice clicks. Yummmmm..I can have it all :) Delicious clicks akka..
My god... I am drooling:) Can't take my eyes off... yummy yummy yummy!! Very beutiful Priya, very delicious and delightful. Love that bowl, makes me hungry already in the morning, i want to finish that whole bowl dear. Dear am very hungry by seeing this...I too have noodles packet for long time am sure i ll try this weekend...Lovely click dear...ur clicks make me drool dear..
Sphagetti with chicken in Chinese style, unique n interesting combo, sounds spicy n delicious mu kind of food...tempting clicks da! Thanx a lot,Priya for linking!! Looks awesome Priya... This chinese spice mix, is this the chinese 5 spice mix. I have heard of it but haven't tried.. Thanks Priya.. Will chk out.. 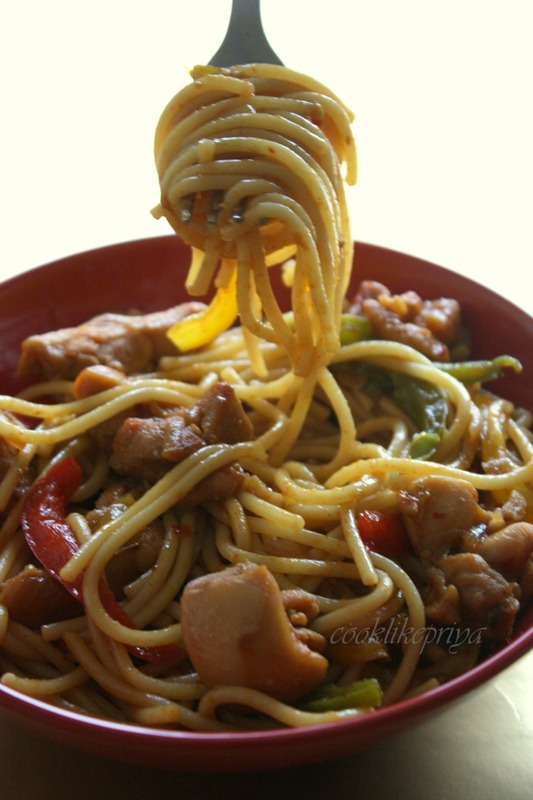 Beautifully made spaghetti in Chinese style.looks very yummy priya. I also make Chinese noodles with what ever noodle shaped pasta I have...even with angel hair pasta too :). They are so easy to prepare and ready within minutes. my !!! who can say no to these!!! !